With 206 bones, over 640 muscles, and 70,000 miles of blood vessels, how does one make sense of the complex interaction of all these systems which make up the human body? Following is a brief list of terms which will help you understand how the back works. Bones form the framework which supports the muscles and internal organs. They are a living tissue comprised of calcium, phosphate, carbon, and other minerals which give them their hardness. Exercise helps the bones to grow stronger. Blood Vessels are structures (tubes) which carry blood to and from the heart. Arteries carry oxygen-rich blood from the heart to the body and veins carry oxygen-deficient blood back to the heart. The Brain is the master controller of the body. All bodily functions are under the jurisdiction of this organ which is safely housed within the skull. Fascia is a connective tissue sheath, sort-of-like the casing around sausage. Fascia wraps around muscle bundles, internal organs, and other structures under the skin helping to hold everything in place. Ligaments are strong fibrous structures which attaches bones together to form a joint. Ligaments do not have a blood supply and take a long time to heal. This is one of the reasons why sprained ankles and backs take so long to get well. Muscles are tissues comprised of cells which can contract. The contraction of muscles allows for movement of the body. Nerves form the "electrical system" of the body. Nerves conduct impulses for communication between the brain and all structures of the body. The Spine is comprised of a series of spool shaped bones which are stacked on top of one another and are separated by cushion-like structures called discs. The spine is comprised of twenty-four movable bones divided into three regions; the cervical (neck), thoracic (mid-back), and lumbar (the low back). These bones protect the brain stem and spinal cord while allowing passage of the nerves to exit into the body connecting to muscles, internal organs, and all other structures. Tendons are tough fibrous bands which attach muscles to bones. Did you ever think about how one moves around? Just to walk requires a series of finely orchestrated actions which begins in the brain as a thought and travels down through the nerves to the muscles which permits the legs and feet to move. The human body, when functioning properly can be thought of as a finely tuned machine. As you are reading this book, your hands may be turning the pages and your eyes looking at the words and pictures, but it is the brain which is in control. By sending and receiving nerve impulses, the brain drives all functions and body actions! 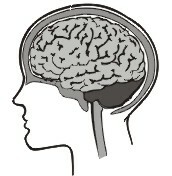 Structurally, the brain communicates to the body via the nervous system. The brain funnels itself through the base of the skull as a structure called the brain stem, which further narrows, forming the spinal cord. The spinal cord is safely housed by the spinal column which is comprised of 24 movable bones called vertebrae. The vertebrae are separated by doughnut-shaped structures called intervertebral discs (discs). The shape of the bones in conjunction with the discs allow the passage of nerves as they travel to all parts of the body. The brain controls and regulates the human body and is protected by the skull. The spinal cord is protected by the bones that form the spine. The spinal nerves leave the spinal cord through the openings between these bones to communicate with all parts of the body. The Synopsis -- the brain sends commands to the body and receives data for processing. These messages are delivered by the ubiquitous nervous system. The nerves travel from the skull as the spinal cord, protected by the 24 bones of the spinal column. There are a series of openings between each spinal bone which permits passage of the nerves out to all parts of the body. Where two spinal bones meet, there is a structure called the intervertebral disc or "disc" for short. The disc acts as a shock absorbing and spacing mechanism permiting additional room for the nerves to exit from the spinal column. The spine is held together by ligaments which work with the vertebrae to form moveable joints. Muscles attach to bones by fibrous extensions called tendons. When muscles contract and relax in a coordinated manner, we get movement of the body. The human body gets nourishment via the vascular system. Blood is pumped through the arteries and veins by the heart. Like the nervous system, blood vessels are everywhere. Remember the last time you cut a finger? It bled and it hurt! This is the vascular and nervous systems in action. How It Works -- Because the spinal column is the pathway through which the brain and body communicates, maintaining optimum balance and function is very important to preventing low back pain. The spinal bones (vertebrae) are held together by ligaments, sort of the way a cardboard box is held together by packing tape. Muscles are attached to the bones via tendons. The coordinated contraction and relaxation of muscles permits movement of the body. If any of the spinal bones lose their normal motion or position, irritation to the delicate nerves as they pass through the openings between the vertebrae can lead to a variety of symptoms such as pain, tingling, numbness, muscle spasm or weakness, or manifest more subtly as perhaps, internal organ dysfunction. Likewise, if there is a muscular imbalance, uneven pulling on the spinal column by these structures can lead to pain. If the guide wires supporting the mast of this sailboat are not properly tightened, uneven stress can cause the mast to break. This is just like the muscles supporting the spine. If the muscles are poorly conditioned and weak, the spine cannot be properly supported and the probability of developing a spinal condition with resultant pain is vastly increased. Four-fifths of the population will experience low back pain at some point in their life and 30% of all Americans are in pain as you read this book. For example; if you were sitting in a movie theater with a person to your left and to your right, statistically, at least one of your small group would be suffering back pain. Back pain is the second most common reason for medical office visits, right behind the common cold. Another interesting fact is that out of all the people who are hospitalized, the most common reason is child birth and running in at second is treatment of low back pain. As you see, low back pain is very common in modern society. Because something is commonly present does not mean that it is normal. Low back pain is a common malady, but to have low back pain is not normal. Low back pain indicates that something is wrong! Following is a quick review of the most common causes of low back pain. This is not an all-inclusive list by any means, but will lend a general idea how complicated the human body is and how interrelated are the sum of its' parts. Mechanical Back Sprain is one of the more common causes of back pain. Generally there will be a trauma linked to the onset of pain such as lifting something which was too heavy, slipping and falling, a sports injury, a car accident, or more insidious -- repetitive motion. What usually occurs during an injury, (be it from frank trauma or repetitive motion) is that an immeasurable amount of damage to the ligaments, tendons, and muscles develop which can weaken and destabilize the joints of the spine. If any of the vertebra (spinal bones) lose their normal motion or position, the result can lead to irritation of the spinal nerves exiting to the body. Nerve irritation can be painful! When any of the vertebrae lose their normal motion or position, there is a change in the mechanical stability of the region. Often times, the nervous system becomes involved. When this occurs there may or may not be perceivable symptoms such as pain, tingling, numbness, muscle spasm or weakness. The technical term for spinal mal-alignment is vertebral subluxation, and in lay-terms, a "pinched nerve" or "slipped disc". Other causes of low back pain can include the vascular system. Almost one-million Americans die each year due to cardiovascular disease. The same conditions that clog the arteries feeding blood to the heart (coronary arteries) leading to heart attack affects the arteries supplying blood to the low back. A diet rich in fats and sugars, low in fiber, coupled with little to no exercise can lead to atherosclerosis, which is a clogging of the arteries. This will decrease the blood supply to the structures of the low back which can become a source of pain. Muscular Strains (pulled muscles) can also produce low back pain. Generally, a pulled muscle is self-limiting and the pain subsides in a short period of time. Arthritis is another potential source of low back pain. More than 50-million Americans suffer with some form of arthritis each year. Osteoarthritis, also called degenerative arthritis is most associated with the wear-and-tear of life. One theory which explains the causation of spinal osteoarthritis has linked chronic vertebral subluxation to this common malady. Spinal mis-alignment can lead to uneven mechanical pressure on the cartilaginous surfaces coating the ends of bones where they meet to form a joint. This mechanical change can lead to abnormal friction, and like the tires on your car requiring re-alignment leads to uneven wear-and-tear. Pregnancy is another condition associated with back pain. Due to hormonal influences on the ligaments and changes in weight distribution as the fetus grows, an increasing amount of stress is placed on the structures of the pelvis and lower back. Child Birth can be very hard on the mother. Misalignment of the sacroiliac joints (hip bones) or sacrum (tail bone) has as the baby passes through the birth canal been clinically demonstrated. This can lead to low back, hip, groin, and/or leg pain (sciatica). Fracture can be a cause of back pain. Generally a fracture (broken bone) is related to trauma (like falling down and breaking the hip). Occasionally a tumor can lead to weakening of a bone causing what is called a spontaneous fracture. Osteoporosis is a thinning of the osseous matrix which gives bones their strength. This loss of matrix makes these generally sound structures very brittle and prone to fracture (breaking). Osteoporosis can indirectly be a source of pain as on occasion, these brittle spinal bones (vertebral bodies) can collapse (fracture) leading to pain. Generally, the vertebra in the mid-back area are more susceptible to this affliction than those of the lower back. Birth Defects are another candidate when consideration potential sources of back pain. A look in the mirror demonstrates that human beings are relatively symmetrical. The left-side of the face looks pretty much like the right-side. The eyes and ears hopefully match one another. The spinal column develops this was as well, with each side matching the other. Sometimes, one side of a spinal bone will grow differently than the other, leading to congenital asymmetry. This unequal spinal development can lead to significant muscle pain and spasm. This is due largely in-part to the muscles pulling on the bones in an effort to stabilize the back. Pain is the result of chronic muscle spasm. Underlying Conditions . . . There are many conditions which can mimic back pain. For example, a Kidney infection can refer pain to the low back and flank area as can some forms of cancer. Males are prone to prostate cancer and females to ovarian cancer, both of which can refer pain to lower back. Bone tumors can be another source of back pain depending on where the tumors are located. From time-to-time, a person will have no physiological problems, yet will complain that they are experiencing back pain. The mind plays a powerful role in the way one feels and there is a well documented body of studies supporting the hypothesis that a person's perception of pain can be altered by mood. Sometimes an individual will develop what is called a psychological overlay. Someone who develops a psychological overlay has experienced pain from an injury or illness and takes the essence of that pain and manifests the physical symptoms into part of their personality. These people are like a child who capitalizes on a minor cut or bruise to obtain maximum sympathy from his/her parent. Other sources of back pain can stem from systemic disease processes such as diabetes, rheumatoid arthritis, and many others. Understandably, sorting through all the potential sources of back pain is complicated. This is why having a health condition professionally evaluated by a doctor of chiropractic or medicine is very important to ensure proper treatment is obtained for a specific condition.